* WINNER of the Scrubbing Bubbles Toilet Cleaning System Giveaway * Lisa is Living the Life of Riley! « U*neaks Shoes and Socks ~ Customize Their Feet to Look NEAT! I want to give a big and hearty CONGRATULATIONS to Lisa, the winner of the Scrubbing Bubbles Toilet Cleaning System from SC Johnson! Lisa now has 48 hours to confirm! 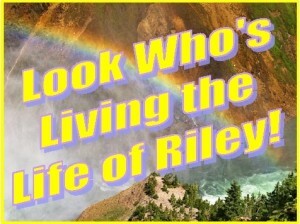 4 Responses to * WINNER of the Scrubbing Bubbles Toilet Cleaning System Giveaway * Lisa is Living the Life of Riley! Hi Lisa, I just wanted to take this time and congratulate you on being the winner! I love to say congratulations so congratulations!! One of the things I love about this website is the giveaway’s that they give. Melissa, dropping in from Lady Bloggers, just wanted to thank you for dropping by my site earlier. It’s great to connect with new people. Sweet blog, btw. All kinds of give-a-ways. Yay! * WINNER of the Baby Dipper Bowl & Utensils Giveaway * Leslie is Living the Life of Riley!